Vintage - E. Hughes & Company, Fenton England, Eusaneos Art Deco Fine Bone China Tea Set, 33-Piece Service for Ten, Circa 1930-41. Art Deco Eusaneos Fine Bone China Tea Set, Service for Ten, by E. Hughes & Co, Fenton, England. This is a beautiful Bone China with a Mint Green Stripe on the Lip, with 22kt Gold Verges on Both Sides of the Stripe, 22kt Gold Feathering on Inner Rims, 22kt Gold Rims, Handles and Feet of Cups. Center of the Plates, Cups, Sugar and Creamer is a lovely Bouquet of Dark Pink/White/Blue and Yellow Flowers, with Green Foliage. Great Condition. 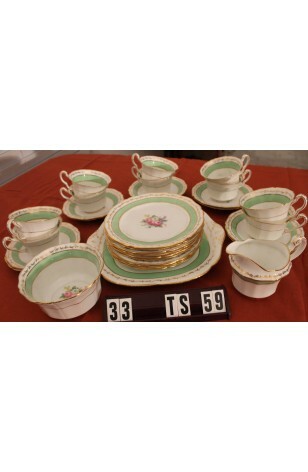 Art Deco Eusaneos Fine Bone China Tea Set, Service for Ten, by E. Hughes & Co, Fenton, England. This is a beautiful Bone China with a Mint Green Stripe on the Lip, with 22kt Gold Verges on Both Sides of the Stripe, 22kt Gold Feathering on Inner Rims, 22kt Gold Rims, Handles and Feet of Cups. Center of the Plates, Cups, Sugar and Creamer is a lovely Bouquet of Dark Pink/White/Blue and Yellow Flowers, with Green Foliage. Great Resale Condition unless noted below or in pictures.